The Board of Selectmen is considering options after some legal fees were questioned at a recent meeting. THOMASTON — Members of the Thomaston Board of Selectmen may replace longtime town attorney Paul Gibbons after questioning legal fees charged to the town. The board was discussing town warrants to be signed during a meeting March 11, when members Beverly St. Clair and Bill Hahn sought clarification on $8,000 in legal fees to be paid. St. Clair said $5,000 was billed for the preparation of an information meeting held last October to discuss the town offices’ move to the former Lura Libby facility, as well as $2,000 to have pictures printed for the presentation. Chairman Peter Lammert said he was asked by Standing Municipal Facilities Committee members Joanne Richards and Susan Devlin to do a segment of the presentation, and Richards said she and Devlin met, as members of the committee, with Gibbons during the preparation process, but did not ask him to take pictures. “In fact, quite a few I took,” Richards said. Hahn said he was unsure whether to sign the warrant, noting the town attorney gets $155 per hour and for him to be paid that while having pictures made would be a problem. 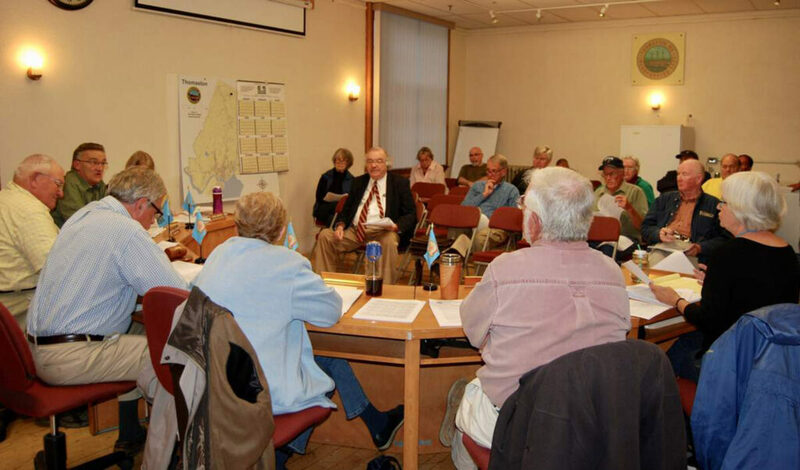 Communications from committee Chairman Zel Bowman-Laberge to the Board of Selectmen indicated that the information meeting was not being put on by the committee, but rather by citizens of the town. “It’s an issue of the integrity of our town attorney,” St. Clair said, adding that she liked Gibbons, but the issues she has seen since being elected to the board are huge. Budget Committee member Patricia Hubbard echoed a statement by St. Clair, saying that $18,000 has been budgeted for legal fees last year and for the coming year, and already there is a total of $54,000 billed. “I’m going to move that we consider new options for a town attorney, and that we all come to our next meeting with a name to do that,” St. Clair said. After a second from Hahn, the board’s voted in favor of the motion 4-0-1, with Selectman Lee-Ann Upham abstaining. St. Clair then called to dissolve the Standing Municipal Facilities Committee. Upham then seconded the motion to dissolve the committee, and the motion passed by a 2-1-2 vote — with St. Clair and Hahn in favor, McCrea opposed, and Lammert and Upham abstaining.